Nearest: Tube Station: Holborn 334 yards (305 metres), Railway Station: London Charing Cross 0.7 miles (1.1 km), DLR Station: Tower Gateway 2.2 miles (3.6 km), Motorway: M1 Junction 1 5.8 miles (9.3 km). This hotel boasts 7 tube stations with a half mile radius (0.8 km). The Kingsley by Thistle Hotel London, an Edwardian building, is located on the eastern edge of the very central areas of London. Bloomsbury Way is the extension of New Oxford Street which is part of one of the capitals best known roads, Oxford Street (just 300 yards away). To the East of the hotel is Holborn which leads down to the City of London (Square Mile), making it very convenient as a mid-way location between the financial areas and the tourist areas. Holborn is very busy during the week but relatively quiet during weekends. Just to the North is Russell Square and the popular area of Bloomsbury which has its own shopping centre and cinema. A short walk (less than 200 yards) to the south finds you in Covent Garden. This would be one of the spots that should not be missed on any London visit. Known for its street entertainers (buskers) and the piazza at its heart with two markets and a string of restaurants and bars. This is a top destination both during the day and in the evening. To the south west is Soho, geared towards adult entertainment but with many pubs and clubs to suit everyone. Also popular for its many varied restaurants. Other local attractions/places of interest include the British Museum (0.1 miles), Sir John Soames Museum (0.3 miles), Theatre Museum (0.4 miles), London Transport Museum (0.4 miles), Pollocks Toy Museum (0.5 miles), Dickens House (0.5 miles) and Petrie Egyptian Archaeology Museum (0.6 miles). The Kingsley by Thistle Hotel (after author Charles Kingsley) is in an area known for its literary prowess. Each bedroom is decorated with a vibrant colour palette of rich reds, greys and creams and all have a very contemporary style. In-room you will find air-conditioning, wireless internet access, a flat screen television with digital channels, hairdryer, in-room safe, direct dial telephone, work desk, laptop sized safe, tea/coffee maker, iron and ironing board. Rooms are en-suite with power shower, complimentary toiletries and a supplied robe. Deluxe and Executive rooms and Suites are more spacious. In October 2010 and to celebrate the hotels first anniversary of its major renovation the Kingsley Hotel launched an in-suite library for guests. Guests to suites have access to an exclusive series of 'lost classics' brought back into print by local publishing company, Bloomsbury Publishing. This is complimented with the Thistle reading pillow and complimentary hot chocolate in each of the suites, with regular guests being able to take the books out on loan, returning them on their next visit. The Kingsley's library of books is available to Junior Suite residents or regular guests who frequently visit the hotel. Onsite is the 'Kingsley Two Restaurant'. The ground floor restaurant serves modern British and European cuisine. This Brasserie style restaurant has a mix of traditional Edwardian features with contemporary furnishings and soft atmospheric lighting to go with the all day dining. Extensive wine list. The fully licensed bar serves snacks, light meals Tea and Coffee and you can view sports events on the satellite TV here. Also serves a full range of drinks including cocktails. Informal style. Open 11:30 weekends from noon. The Kingsley by Thistle hotel has 7 air-conditioned meeting rooms with a capacity for up to 100 delegates. The front desk is staffed throughout the night. Bloomsbury Park Hotel (Thistle): is 373 yards (341 metres) away, has a guest satisfaction score of 80% and rates start from about £85. every hotel Piccadilly: is 0.6 miles (1.0 km) from here, earns a customer rating of 89% and base rates begin at about £167. Royal Trafalgar Hotel (Thistle): 0.7 miles (1.1 km), rated at 88% and with rates from around £151. Thistle Euston Hotel: 0.9 miles (1.5 km), rated at 80% and with rates from around £86. Compared to other London hotels: This hotel has been rated 88% by past guests. The London average is 80% and the average for 4 star hotels is 83%. Therefore this hotel is above average for its sector (star rating) and for London as a whole. Thistle Hotels across the chain average 80% so this hotel is one of the better rated Thistle hotels. Milesfaster ranking: 187th from 866 London hotels, 2nd of 9 Thistle Hotels, and 73rd of 328 four star rated hotels. Another to Consider: A similar type of hotel (size, rating) nearby (0.0 miles, 0.0 km) would be the 4 star Novotel London Tower Bridge, with rates that start from about £165 and which has an 83% guest satisfaction rating. The Novotel London Tower Bridge also offers: free WiFi. We can also suggest a cheaper options nearby which would be the Doubletree By Hilton Tower Of London. 0 miles away (0.0 km), has scored 89% from former guests and has rates from around £119 (theres free WiFi too). 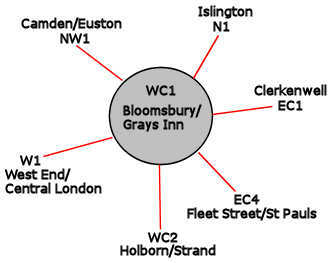 The 50 hotels nearest to this location (Bloomsbury Way, WC1 postcode) that we list cover a 0.5 miles (0.8 km) radius. They include 9 five star hotels (average rating 91%), 24 four star hotels (average rating 85%), 14 three star hotels (average rating 78%), 2 two star hotels (average rating 75%) and 2 one star hotels (average rating 62%). Of the local hotels the highest rated are Montague On The Gardens Hotel (4 star), the Covent Garden Hotel (5 star) and also the Soho Hotel (5 star) (all joint top with 99%). For the fifty one local hotels we hold base rate data on all of them. The average starting rates for the surrounding area are around £133 per night. They range from a low of £18 at SoHostel (2 Star, 80%) to a high of £363 at Rosewood London Hotel (5 Star, 98%). The breakdown by star rating shows the following averages: Five Star average: £262, Four Star average: £130, Three Star average: £81, Two Star average: £38 and One Star average: £53. Our in-house ranking based on guest ratings but adjusted for influencing factors ranks Kingsley By Thistle (The) 20th of the 50 local hotels and 11th for the 24 four star hotels in the area. For base rates the hotel ranks 30th of 51 (11th of 24 four star hotels.). Taking into consideration both rates and guest ratings we rank this hotel 14th of 48 of the local hotels in terms of value for money (SoHostel was top). Bought by Oriental Holdings Bhd for £42.71 million in February 2012. Between August 2008 and Spring 2009 the Kingsley Hotel, London underwent a £9.5 million pound refurbishment to recapture the glory of its Edwardian Past. A complete makeover and refurbishment that included the hotels Victorian facade.